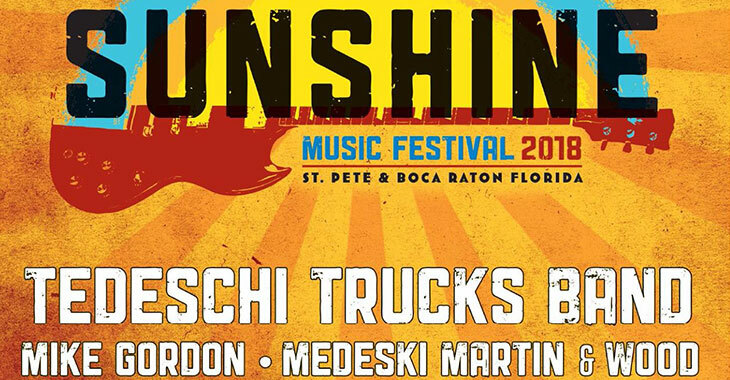 The sixth annual Sunshine Music Festival returns to Florida for two nights in January, featuring another carefully-curated lineup of Derek and Susan’s greatest musical friends. This year’s edition features performances at Vinoy Park in St. Petersburg on January 13 and Mizner Park Amphitheatre Boca Raton on January 14, with appearances by Tedeschi Trucks Band, Mike Gordon, Medeski Martin & Wood, Galactic, Hot Tuna, Foundation of Funk (ft. Zigaboo Modeliste, George Porter Jr., Eric Krasno and John Medeski) and The Suffers. Pre-sale tickets for both shows are available starting on Tuesday, September 26 at 10am ET via TedeschiTrucksBand.com/Events — there’s also early-bird tickets available now at all price levels via SunshineMusicFestival.com. For those looking to book travel for this Winter getaway, we’ve secured some special hotel deals for each night. For questions or issues with hotel reservations please contact us at info@derekandsusan.net.